AGL Energy has commenced drilling the first of a minimum four well oil exploration program in ATP 1056P south-west Queensland. AGL's interest in the permit was acquired as part of its Mosaic Oil acquisition in October 2010. It has a 40 per cent interest and is operator of the joint venture. The four well program is expected to take up to eight weeks to complete, after which up to three additional wells may be drilled. The prospects to be explored range in size up to 2.2 million barrels of recoverable oil on an unrisked basis, it said. DUET Group and Alcoa of Australia have approved the $200 million equity recapitalization of Dampier Bunbury Pipeline (DBP) that was foreshadowed at the time of DUET's recent equity raising. Expected to be completed in early October, the $200 million investment will be applied by DBP to repay the remaining $32 million SOLA balance owed to DUET entities and to pay down $168 million of senior bank debt. The recapitalization will result in a material degearing of DBP with the ratio of net debt to regulated asset base reducing from 72 per cent to around 66 per cent, said DUET. Shares in Sims Metal Management hit a two year low of $12.02 on 26 September. This has not stopped the company continuing with its long standing acquisition program. Its electronics recycling division, Sims Recycling Solutions (SRS), has expanded its Information Communications Technology (ICT) Asset Recovery business into mobile devices with the acquisition of S3 Interactive Ltd (S3i). Glasgow based S3i was founded in 2004 and is a UK leader in the recovery, repair and refurbishment of smart phones and tablet computers. It specializes in recovering end of life and defective mobile devices from manufacturers' warranty and non-warranty service providers. The devices are refurbished and sold globally. The founder, Philip Johnston, and management team are staying with the business. Sims' group chief executive, Daniel W. Dienst, said "Our SRS business is already a global leader in the recovery of ICT assets such as laptops, desktops and servers. The acquisition of S3i will position SRS in the rapidly growing market of mobile devices while leveraging S3i's sector leadership into our existing global operating infrastructure." Envestra is offering shareholders an opportunity to purchase up to $15,000 in additional shares through a share purchase plan. The price will be the same as for the dividend reinvestment plan - a 2.5 per cent discount to the 10 day volume weighted average price. Lynas Corporation shares hit a one year low of 85.7 cents on 26 September, but quickly bounced back above the $1 level. The one year high was $2.70 in April. Around the same time director Kathleen Conlon indirectly acquired 18,154 shares at $1.075 each. Ceramic Fuel Cells has received an order for 100 BlueGen gas-to-electricity generators from its distributor in The Netherlands, Zestiq BV. The units will be delivered over the next 12 months. Zestiq was appointed a BlueGen distributor in July 2011. Zestiq will sell the BlueGen units to small commercial and residential customers in The Netherlands. The units will be installed and maintained by Eneco Installatie Bedrijven, the service company of Dutch energy company Eneco. No sale price was given for the units but the company said other deals have been around the 25,000 per unit. The company recently received an order for 100 units from its German distributor sanevo. Ceramic Fuel Cell's 2010-11 revenue was $3.7 million so such sales have the potential to make a significant contribution. Infigen Energy is seeking community feedback on the feasibility of a wind farm co-operative as part of its proposed Flyers Creek Wind Farm near Orange, NSW. The proposed co-op would provide the local community with the opportunity to have a direct financial stake in the project. A public meeting on 13 October aims to establish a community stakeholder group to assess the feasibility of a co-op, and will give local residents the opportunity to discuss the proposal with Infigen, ask questions and provide input on how the co-op could be developed. The community stakeholder group, with Infigen's support, would be responsible for developing the co-op proposal and seek regular feedback from the local community. Community owned wind farm co-ops are being developed around the world and are part of a growing trend in Australia. Local and community ownership of wind projects, ranging from full ownership of small projects to smaller levels of participation in larger projects, can bring significant benefits to the local community and economy, says Infigen. Tox Free Solutions is to acquire Pilbara Waste Pty Ltd if due diligence this month is satisfactory. Pilbara Waste is a leading solid waste management company servicing the Port Hedland region. The purchase price is $4.54 million cash. In addition. Tox Free will assume current vehicle finance leases value at $1 million. Pilbara Waste's fixed assets are valued at approximately $3 million and are included in the sale price. CBD Energy received a query from the ASX regarding the fall in its share price 9.5 cents to 6.7 cents on increased trading volume. CBD said it was not aware of any unannounced information which could explain the trading. Clean TeQ is to build its first commercial water treatment plants for the coal seam gas industry. The company has won a contract to supply two water treatment plants for the desalination of produced water at QGC Pty Ltd's Condamine Power Station in Miles, Queensland. QGC is a BG Group company producing coal seam gas for domestic power and developing the Queensland Curtis LNG project at Gladstone. The water treatment project is to treat 4 megalitres per day and is due for completion in the second half of this financial year. The contract value is $1.855 million for the design and supply of two Continuous Ionic Filtration (CIF) water treatment plants. Clean TeQ says the CIF plants operate in conjunction with reverse osmosis (RO) to provide very high recovery of water and lower brine volumes. The CIF plants precondition the water by removing metal scale potential and bicarbonate, allowing the reverse osmosis process to operate at its optimum water recovery and with improved reliability. The CIF plant is built on Clean TeQ's proprietary Clean-iX ion exchange technology, which is now coming to market after a 10-year research and development program. The CIF-RO water treatment plants will allow QGC to remediate the produced waters currently stored in evaporation ponds for beneficial reuse. Such beneficial reuse is critical for the long term sustainability of the coal seam gas industry. The treatment of produced water for reuse as industrial, agricultural, potable and environmental flow waters forms the foundation of Clean TeQ's focus on water treatment solutions for the coal seam gas industry. The treatment of water in the industry is a major issue for the gas producers and water treatment solutions such as CIF are needed to enable the industry to prosper, it said. "We believe that this project will become a landmark in water treatment in the coal seam gas industry," said Peter Voigt, chief executive of Clean TeQ. "The flexibility of our Continuous Ionic Filtration technology means that it can treat a variety of water qualities and we see a big future for the treatment of produced water in the gas, oil and mining industries." Clean TeQ received acceptances under its Entitlement Issue for 67.1 per cent of shares on offer totaling 18.37 million shares and $679,736. The shortfall was 8.99 million shares representing 32.9 per cent of entitlements. ERM Power has acquired a 6 per cent interest in listed gas company Metgasco, diversifying its gas investment strategy on the east coast. Managing director and chief executive Philip St Baker said it was a modest investment that provides exposure to anticipated rising gas prices in eastern Australia, and that ERM Power is comfortable with the shareholding at this level. "ERM Power has a diversified gas investment strategy on the east and west coasts of Australia which includes direct investment in oil and gas exploration and production, direct gas procurement and direct (shareholding) investments in gas exploration and production companies," he said. Gale Pacific director John Murphy has increased his holding in the company to 1 million shares with the indirect acquisition of 190,905 shares for $40,090. The average price was 21 cents each. Managing director Peter McDonald said Gale's recent share price of 20 cents reflects earnings per share of 8 times 2010-11 actual earnings. Based on a 20 cent share price the 2010-11 fully franked dividend of 2.2 cents represents a yield of 11 per cent. Dividend payments are comfortably below operating cash flow in 2010-11 after allowing for capital expenditure, he said. The company is pursuing new market opportunities in South Africa, South America, Europe and India. Blue Energy has appointed Karen Johnson as a non-executive director. Ms Johnson has over 20 years of accounting related experience, having held senior roles in audit, assurance, technical consulting and financial accounting engagements within Chartered Accounting firms and American Express Inc.
Blue Energy said she brings excellent investigation, analysis and report writing skills combined with strong technical accounting knowledge and a superior understanding of Australian Accounting and Auditing Standards. She previously provided corporate governance consultancy to many organisations, and is currently Director - Audit and Assurance with Whitehills Business Advisers & Chartered Accountants in Brisbane. Carnegie Wave Energy's next generation of commercial scale CETO unit, CETO 4, has been manufactured and delivered to its deployment location on Reunion Island by French marine defence contractor DCNS. The unit will undergo pre-deployment testing similar to the CETO 3 pre-deployment testing at the Fremantle test facility earlier this year. Once this testing is completed, and subject to completion of final installation aids, offshore installation is scheduled to take place during the Southern Hemisphere summer. The CETO 4 unit will be deployed and tested offshore at the Reunion Island project site. Successful testing and operation would be followed by a grid-connected 2 MW CETO project at the same site with further expansion to 15 MW. Activities so far have been two-thirds funded by French Government grants and the grid connected project will receive a marine energy feed-in tariff. Managing director and chief executive officer, Dr Michael Ottaviano said, "The CETO 4 project represents the first joint project activities of Carnegie, EDF EN and DCNS. As well as testing the CETO system in a different wave climate, we've taken the opportunity to test some new design ideas." The CETO 4 project follows the signing of a technology licence and joint venture agreement with EDF EN in 2009 and a Memorandum of Understanding with EDF EN and DCNS in 2010. Eden Energy said that growing demand for its OptiBlend dual fuel kit, particularly in India and the US, has led it to introduce a number of improvements to the kit. These include aesthetic and maintenance improvements to benefit both Hythane and its end users. The robust operational design and performance remains the same, as does pricing for the base system. The most apparent change to the Next Generation OptiBlend will be in the screen display size, which has been increased by 315 per cent, and is available as a colour display. The control box has been reduced in size by nearly 70 per cent while still accommodating the new screen. The new control box has increased functionality, including modbus/ Ethernet communications, remote data monitoring, and real time remote monitoring. The auto tune feature, which allows for faster system commissioning, is still available and can now be performed seamlessly on a single screen. Also offered is a fuel savings display that shows the amount of diesel fuel being displaced with natural gas, and calculates the operational savings. The Next Generation OptiBlend can accept programing changes via a USB stick, allowing faster and easier software updates around the world. As the number of OptiBlend units in the field increases, this straightforward software support will be critical, said Eden. Another benefit is increased parts availability, with parts able to be sourced in both USA and India. Enerji has issued 1 million shares and 0.5 million listed options with an exercise price of 3 cents expiring 30 June 2015 to a private investor. The funds raised will go towards providing funds for installation of the first Opcon Powerbox at the Carnarvon Power Station. The first third generation Opcon Powerbox has arrived in Australia. After clearing customs, it will be on display for a few hours to investors and media before undergoing a series of inspections, including with WorkSafe. It will then be delivered to Horizon Power's Carnarvon Power Station for installation around November. Chief executive officer Greg Pennefather said "We now have our cornerstone technology ready for installation at Horizon Power's Carnarvon Power Station and I am confident that the Powerbox will be generating electricity in Carnarvon by the end of 2011." Opcon Powerboxes transform waste heat energy into electricity and have numerous applications to industry. It costs between $2.9 million and $3.5 million to build, transport and install an Opcon Powerbox and associated heat recovery system. Enerji generates revenue through long-term power purchase agreements. GFK Investments has become a substantial shareholder in Green Invest with a 19.9 per cent interest. GFK is associated with Robert bell, who is a director of both Green Invest and GFK Investments. Kimberley Rare Earths can earn up to a 90 per cent interest in a pegmatite-hosted rare earth project in Mozambique, with significant exploration potential including for xenotime-hosted yttrium, dysprosium and erbium. A Heads of Agreement has been signed with Great Western Mining, a gemstone mining company incorporated in Mozambique. The terms include cash consideration of $300,000 payable up front for 40 per cent interest in non-gemstone rights, then a cumulative $4 million over 5 years to earn up to 80 per cent, with a right to increase to 90 per cent by sole funding to production. Healthcare solutions company MediVac said its latest model MetaMizer 240 SSS clinical waste converter is completed full functionality testing and the results have exceeded the company's expectations. Footage of the new MetaMizer in operation has now been incorporated into a new marketing video that can be viewed on the company's website under the MetaMizer tab or clicking on: http://www.medivac.com.au/technology-in-waste-disposal.html. The MetaMizer is an environmentally-friendly alternative waste management system for hospitals and quarantine facilities. It provides sterile, safe waste disposal on site, reducing waste to landfill by up to 90 per cent and weight by 30 per cent. The processed material is granular and can be recycled or buried in landfills safely. lake north of Toronto in Canada. The company said the application is an important development in building Phoslock Water Solution's Canadian business. The primary objective is to reduce phosphorus loads entering Lake Simcoe and measure Phoslock's ability to prevent the re-release of phosphorus from the identified area in the sediments of the Holland River. The application site will be monitored over the next few months. If the application is successful, future applications will be planned for similar sites along the Holland River. The application was a collaboration between Lake Simcoe Regional Catchment Authority (LSRCA) and the Holland Marsh Joint Services Board, and was funded largely by Environment Canada through the Lake Simcoe Clean-Up Fund. In addition, a number of applications are also scheduled in 2012 to treat stormwater ponds in the LSRCA area which have been identified as contributing phosphorus from their sediments. As part of its strategy to diversify into non-geothermal energy, Torrens Energy will transfer its geothermal land holdings into a new subsidiary, Torrens Energy South Australia Pty Ltd (TESA). The company said this will allow it more latitude to focus on its search for new opportunities while preserving its interests in the geothermal prospects it has built up over the last six years. Although the Government has introduced new funding programs to spur investor interest in geothermal energy, Torrens Energy said it must be realistic about lead times of delivery under these schemes. "With uncertainty still surrounding the Governments proposed carbon scheme, we must continue to give consideration to non-geothermal opportunities in the broader energy sector," it said. The company's recent rights issue has bolstered its working capital to $3.7 million, giving it capital to look for entry points to new energy opportunities. "It is a tribute to Australian perspicacity in the resource sector that there is no shortage of promising new energy projects around the globe seeking funding and a corporate home. Indeed Torrens Energy has reviewed many such projects in 2011, however the search continues for a project of sufficient quality to chart a new direction for the company," it said. It remains to be seen what opportunities it chooses and how environmental these are. The company said "It's been a salutary year, not only for Torrens Energy, but for the Australian geothermal industry in general. The lack of investor confidence that emerged last year has played out as expected, through this year. 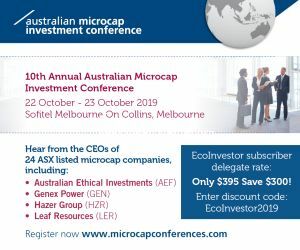 It remains true that after nearly a decade of investment, technological innovation and enduring persistence, we still do not have demonstrable proof-of-concept project in Australia  a fact that is not lost on the investors." In April Torrens said it would wind down its geothermal operations to preserve capital, and give consideration to non-geothermal opportunities in the broader resource sector. Torrens Energy has negotiated the renewal, consolidation and deferral of geothermal expenditure requirements including deep drilling, assuring that the company's licences to continue in good standing. The company said investor confidence in geothermal may be partly restored through a surge of new interest and funding initiatives from Canberra - the Governments new Australian Renewable Energy Agency (ARENA) has set aside over $200 million or 45 per cent of its renewables funding for geothermal support. In addition there has been a loosening of the funding rules with Government softening its position on the unsuccessful 50:50 "matched funding model" to consideration of what the market will bear. WestSide Corporation said gas has been flowing from one of seven new Meridian SeamGas production wells at a rate of up to 680,000 standard cubic feet a day as it progresses toward peak production - making it one of the gas field's top producers. The seven new well sets are expected to produce 6-7 terajoules per day (TJ/d) as Meridian SeamGas advances plans to lift production toward 25 TJ/d by the end of calendar 2012. Chief executive Dr Julie Beeby said the new well-sets are located at Pretty Plains in the co-development area on the Dawson Coal Mine's Mining Lease near Moura in Queensland's Bowen Basin. The flow rate from Pretty Plains of up to 680,000 standard cubic feet a day is from just two of the multiple seams available for future production, she said. "Pretty Plains 2 remains controlled via water and gas pressure at present, so a peak significantly higher than the current production rate is anticipated as the well is gradually allowed to flow freely over the next few months," said Dr Beeby. "The other new production wells are progressing in a similar manner and we are confident of achieving increased production in the coming quarter." Work-overs on 22 wells have arrested field decline and delivered approximately 2.7 TJ/d of production since 1 July 2010. A further 19 wells have been targeted for production enhancement.